My wife has this crazy phobia of clowns and I just don't get it. I mean when I watched 'IT' for the first time I just thought he was funny and sort of cute. And real life clowns are just regular people in costumes. I don't get clown phobia! I wouldn't say I'm afraid of them, but I am definitely creeped out by them. clowns always have and probably will bother me. im not sure why but i have always strayed away from them. my brother is the same exact way. he is so bothered by them he would never go to the circus. its like one of his top 5 things that scare him to this day and he is married with kids. I am not scared of clowns they just creep me out. My ex fiencee collected clowns, his whole house was all clown stuff. creepy. clowns freak me out! i heard they are reamking IT i guess will see, I still have seen the original because of clowns. Stephen King's IT didn't help. I was 8 when I watched that and it freaked me out. I actually love clowns but I can see why some think they are creepy. I used to be crazy afraid of clowns until one day I saw this one that was soo creepy that I was infatuated with it hahaha! Now I love them! I can't explain it...the fact that they are soo creepy to me makes me think they are that much more awesome! Not afraid of them--which is weird nce I made 2 movies called "Fear of Clowns"(1&amp;2) but we actually asked a lot of people on the Behind The Scenes why they thought people were afraid of clowns. There were some good answers. Much of it boils down to the fact that they're wearing a mask(even though it's a face-paint mask) and we're just primed to be wary of masked strangers. Some people pointed out Poltergeist as the place in time where they began to get creeped out by clowns. Carnies, Clowns and Little People. 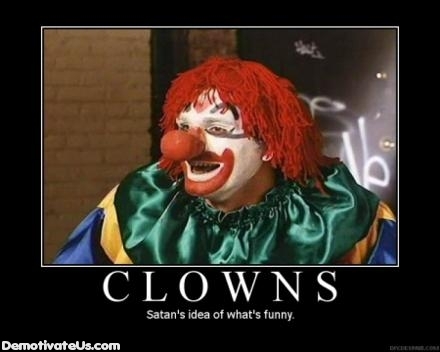 By all means Clowns are the worst though.